The beautiful Cook Islands are located between New Zealand and Hawaii in the South Pacific. With a warm tropical climate, glistening turquoise waters and white sandy beaches speckled with black volcanic rocks and palm trees – its paradise! The locals are incredibly friendly and always go out of their way to help. During your Cook Islands vacation you’ll find it very slow paced, perfect to wind down and get that long needed rest & relaxation you’ve been craving. However, when you get the need for adventure, there’s lots to be found without looking too far. Maybe go scuba diving or snorkeling at the ‘Fruits of Rarotong’ – the best spot to see coral & fish. Learn to ‘crack open’ and eat a coconut while on a sightseeing tour around the islands lush green forests. Catch that elusive ‘big one’ on a game fishing day tour, or rent a bike or motor scooter and circumnavigate the island at your leisure. For a different pace attend Church on Sunday – even if you’re not religious. Listening to the amazing voices of the local parishioners singing their hymns is a magical experience (really, it’s a ‘must do’!). For evening entertainment, make sure you don’t miss the experience of an ‘Island Night’ – another must do! It’s where the islanders tell their cultural stories by song & dance in full custom dress. It’s a very spectacular and fun-filled affair. If it’s romance you’re looking for then spoil yourselves to a full-service private meal on the beach and watch the spectacular sunsets – perfect for honeymooners! For that special lady, maybe buy her a stunning piece of quality jewelry with some locally harvested and very valuable Cook Island black pearls. Explore a nearby uninhabited island by canoe with a resort prepared picnic hamper in hand. Then book yourself in for a luxurious Spa experience. For dinner, sample delicious native cuisine at quaint local restaurants like ‘Tupuna’ restaurant; which has the perfect combination of a relaxed casual environment (beach sand floors) and an incredibly mouthwatering local menu. If you’re a foodie there are many delights to sample; Banana Poke, Ikamata (kinda like ceviche), an ‘Umu’ (a meal cooked underground) and an abundance of local fruits and vegetables like Taro, Paw Paw, Papaya, Star Fruit & Coconuts. Tourism and hospitality is their largest industry, yet there are not any large hotel chains on the Cook Islands. 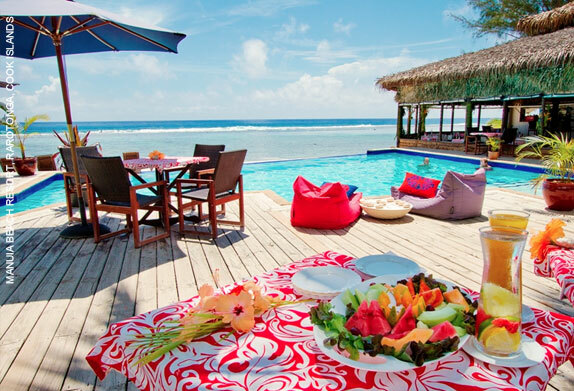 Most Cook Island accommodations are family owned, locally run resorts that emit a lovely friendly ambiance with warm hospitality. The locals love to spoil you! 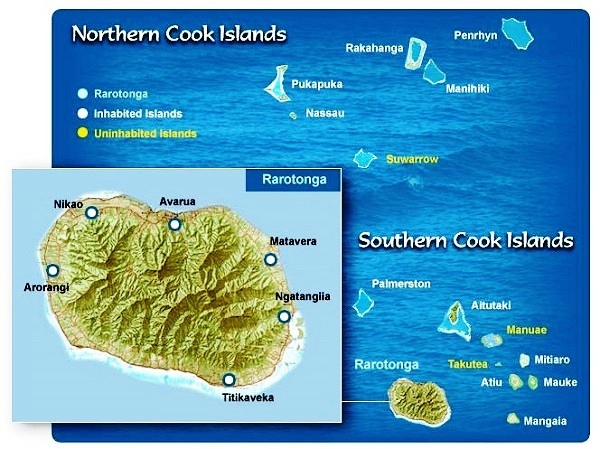 The Cook Islands are easily accessible with direct flights operating from Los Angeles to Rarotonga. And if you have a little more time, the flight routes are perfect for combining a visit to the Cook Islands with your New Zealand vacation. Activities: Enjoy Rest, Relaxation & Romance. Soft adventure activities include kayaking, short walks, swimming & spa treatments. Wine & dine by the beach. Vacation is customizable.